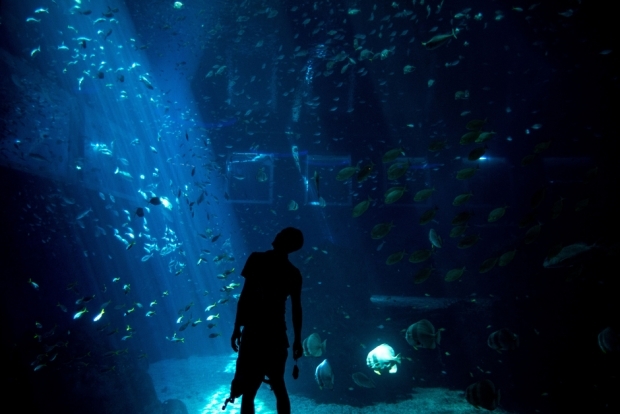 A visitor looks at marine wildlife on display at Resort World Sentosa’s Marine Life Park, January 18, 2013 in Singapore. The marine park, which opened last year, is the world’s largest aquarium with 12 million gallons of water. By Cecilia Tortajada and Asit K. Biswas. Tortajada is president of the Third World Centre for Water Management and past president of the International Water Resources Association. Biswas is the founder of the Third World Centre for Water Management and Distinguished Visiting Professor of the Lee Kuan Yew School of Public Policy, Singapore. This article was first published by chinadialogue. When the tiny city-state of Singapore gained independence in 1965, its social, economic, political, and environmental constraints appeared so formidable that many of those looking in from outside predicted a future of dismal dimensions. Forty years on, the reality looks very different. Within a few decades, the state— just 714 square kilometers and with very limited natural resources— has turned itself into a role model: a country with increasing per capita GDP, a clean environment, and vibrant innovation. From China to Myanmar, “learn from Singapore” has become a common refrain. Today’s emerging economies are right to single out Singapore for study, and they should pay particular attention to its history of water management. In the face of multiple challenges— surging water demands due to rapid economic development; a thirty-fold rise in GDP; a 23%-plus increase in land area through reclamation; a tripling of population; thriving industry— water security has actually improved. Though Singapore is still dependent on imported water, it aims to become self-sufficient within fifty years. Between 1965 and 2011, total water consumption in Singapore increased from 70 to 310 million gallons per day. To meet the challenge of this increase, the state has expanded its water catchment— the area from which rainwater is collected through a network of drains, canals, rivers, and stormwater collection ponds— to 67% of the area of the island, compared to only 11% when it became independent. Singapore still buys a lot of its water from Johor, in neighboring Malaysia, but at the same time as water demands have grown, the city-state has worked to reduce its heavy reliance on imports. One of two key water agreements with Malaysia expired in 2011. Under the second, a maximum of 250 million gallons per day can still flow to Singapore. The state aims to cut this figure to zero within fifty years. The latest available technology has been used to expand Singapore’s water supply base, manage water quality, and reduce the energy consumption of its water activities. Examples include the development of non-conventional water sources, such as very high-quality treated wastewater known as NEWater and desalinated water. NEWater already meets 30% of the national water demand, a figure expected to rise to 50% by 2060. It has become a chief alternative for the growing industrial sector and reduced pressure on potable water. Desalinated water meanwhile satisfies 10% of total water demand and is expected to cover 30% by the year 2060. Participation of the private sector in infrastructural development has also been encouraged: water pricing has been set at a marginal cost since 2000, while the public has been involved through decades-long communication and information efforts. Technological advances have been integrated into water policies as one of the many elements necessary both to increase available supply and maintain high water quality, while different ministries proved able to coordinate their water strategies. Notably for China, laws and regulations have been stringently enforced: there were more than 29,000 prosecutions relating to environmental offenses in Singapore in the thirty-two months between 1968 and 1971 alone, marking a move by the state to enforce environmental law decades ahead of its Asian peers. These are lessons that could be considered by emerging economic powers like China, where fast growth and its associated pollution have triggered serious economic, social, and environmental concerns. The ten-year clean-up of the Singapore River is one example of coordinated planning, though it took time to come to fruition. Success was made possible by the large-scale re-development of central Singapore and the elimination and control of the sources of pollution entering the river so that water could be used safely and cost-effectively for potable use. It was not a quick process, and Singapore learned lessons along the way, including the need for support at the highest political levels to permanently solve pollution problems. Since the river was the main trade artery of the island and growing economic activity along its banks attracted increasing numbers of people— squatter colonies, hawkers, backyard industries— the problem was repeatedly sidestepped. The net result was that increasing quantities of domestic and industrial wastewater and solid waste was discharged into the river, seriously affecting its quality. It wasn’t until former prime minister Lee Kuan Yew gave an ultimatum to ministries and agencies in 1977 that things started to change. They were instructed to work together to improve the water quality of the river, identify the domestic, commercial, and industrial pollution sources blighting the waterway, create relevant legislation, and, ultimately, redevelop Singapore’s entire central area. More than 26,000 families were resettled into public housing, significantly improving their living conditions. Almost 5,000 street hawkers, more than 46,000 squatters, and some 800 lighters— barges used to transport goods along the river— were relocated. Around 2,800 industrial cases of backyard trades and cottage industries were also moved, most of them into newly developed industrial estates. Finally, some 610 pig farms and 500 duck farms, which used to discharge untreated wastes into the river, were phased out. At US$240 million, the clean-up of the Singapore River wasn’t cheap. But a tally of the benefits— both direct and indirect— makes clear it was a sound investment. The program transformed the face of Singapore. Land values along the river banks soared, as did tourism and business. Lee Kuan Yew noted during a personal discussion with us that the main driver for long-term strategic planning was the search for water security. During his premiership, water was prioritized to the extent that economic development was subordinate to the impacts it could have on water resources. This strong political support from the highest levels of government has been instrumental to the state’s development. It is said that Singapore has been able to thrive because of its small size and that its experiences are therefore not relevant to other countries. On the contrary, without a hinterland and almost no natural resources, the tiny island has had to formulate long-term, creative solutions to ensure economic growth and a livable environment. Lee Kuan Yew realized as early as the late 1960s that, in the long-term, it is much more expensive for a society to live in a polluted environment than a clean one. Almost half a century later, most of the world’s leaders are still to grasp this fact.